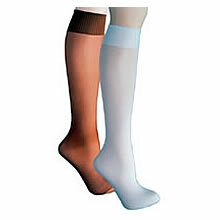 High-quality, durable, technically-advanced hose comfortably "hugs" your legs in two directions. This reinforcement absorbs the pressure that builds up in your legs and leg veins during a day spent on your feet, keeping them feeling refreshed and invigorated. This pressure, which could otherwise cause varicose veins, spider veins, and fatigue, is gently counteracted, leaving you with great looking, great feeling legs.